I haven’t posted a recipe in awhile so here you go! These are the best pancakes ever created – at least that’s my most humble opinion! We call them “Grandma Pancakes” because my amazing grandma would make them for us (if we begged enough) each time we’d go visit her. 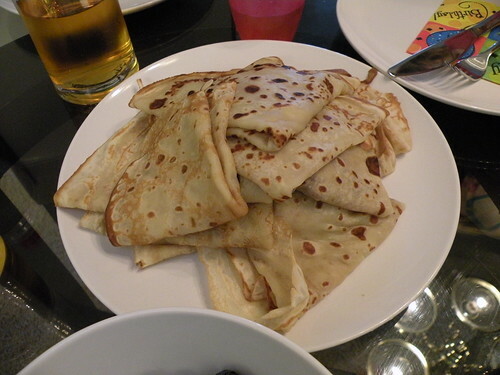 They are very similar to crepes and taste heavenly. I’m getting hungry for some just looking at these pictures! I’ve made these at least ten thousand times and my personal modification is to mix it all together in a blender. If you mix it in a bowl for some reason it seems to get clumpy. Maybe you awesome bakers out there know a secret that I don’t to keep those clumps out. 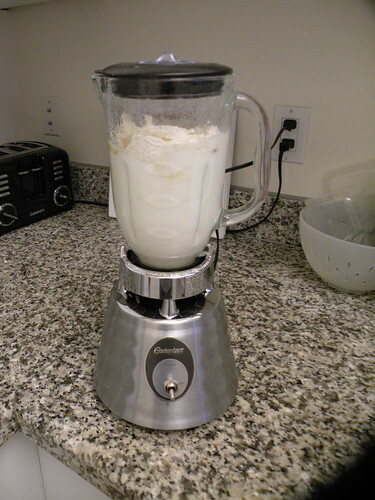 Personally, I love just using the blender. Mix/blend until smooth. This mixture should be very soupy – not thick like regular pancake mix. If it’s too thick add a little water. Preheat non-stick frying pan on medium to medium-high. Spray cooking spray on pan before each pancake. 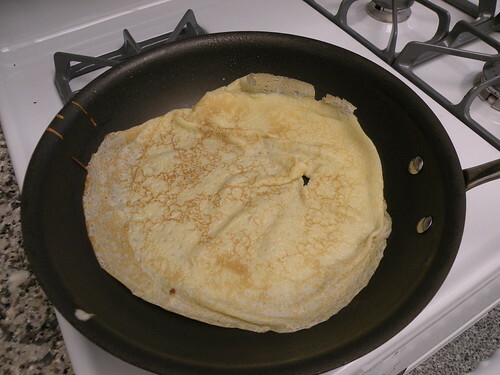 Pour one ladle of pancake batter into skillet and tilt skillet around until entire bottom and sides of skillet are covered with a very thin layer of batter. 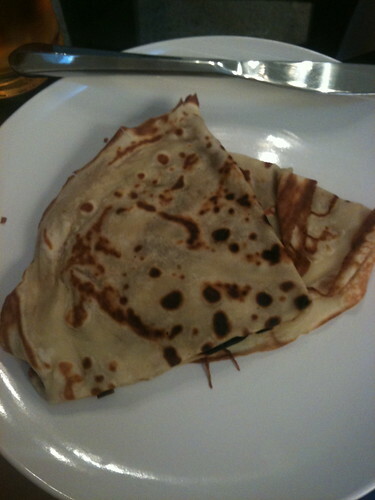 Cook until browned on bottom then flip pancake and cook until dark brown (but not burnt). Fold in half and then in half again. Here is a copy of the recipe that’s easy to copy and print. Mix/blend until smooth. Preheat non-stick frying pan on medium to medium-high. Spray cooking spray on pan before each pancake. 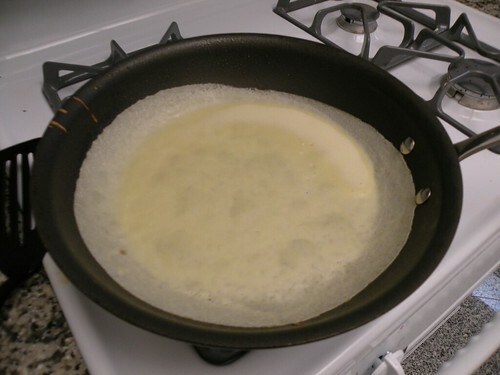 Pour one ladle of pancake batter into skillet and tilt skillet around until entire bottom and sides of skillet are covered with a very thin layer of batter. Cook until browned on bottom then flip pancake and cook until dark brown (but not burnt). Fold in half and then in half again. Serve with syrup. I love the egg shell measurement. 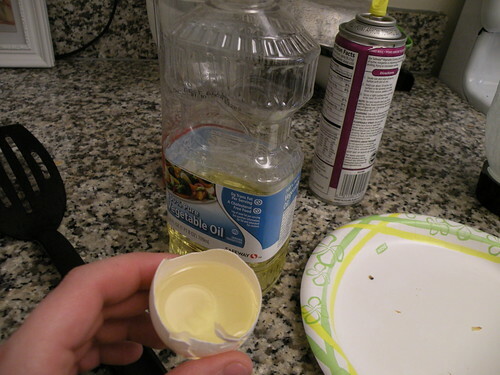 I have a recipe from my grandma that calls for 2 wooden spoons of oil. 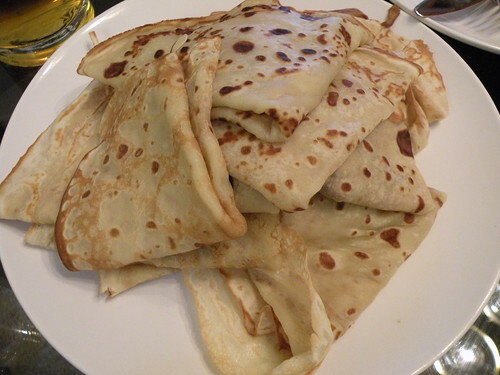 Thanks for the recipe, I have never tried crepes before. I will have to try it. I just skimmed past the Title very fast to see the pancakes and I actually thought it said……”Grandma’s Death Pancakes”. I thought Whooo Allison — what a name to give our pancakes – I know she died and all, but that is horrible. 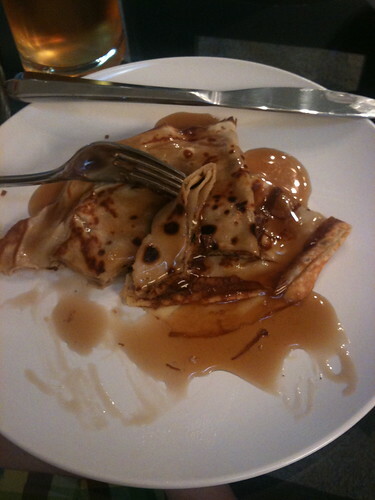 then I scrolled back up and saw it was “Danish” pancakes. That’s better. Maybe I need new glasses. 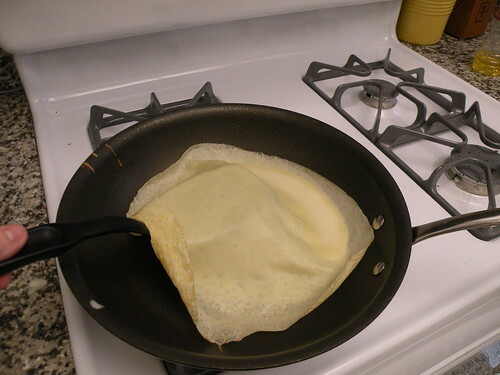 Crepes are great! We just had them the other day for dinner. The boys were more than a little confused when we pulled out the whip cream for dinner! Once they saw Dad stuff add some raspberries to his cream, they jumped in also. 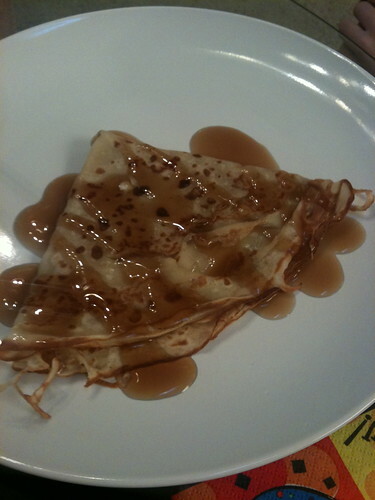 I love it when the hot crepe melts the cream and it gets all drippy! YUMM! Delicious! 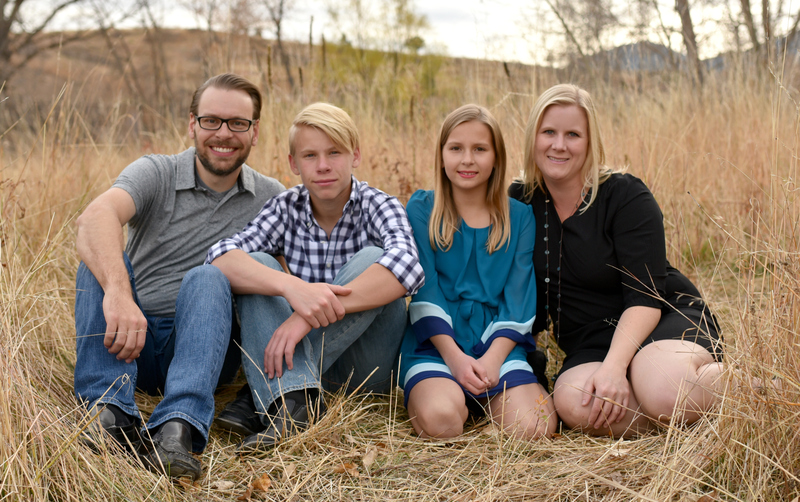 Come link at my party: Thursday’s Treasures!! Don’t you just love grandmom’s recipes. I have a receipe from my grandmother that calles for 2 eggs of water. Those look delish! I’m passing this recipe on to my hubs to try this weekend instead of our usual crepes! Mmmm. Yummy. Those look great! Thanks for sharing at Fun to Craft’s Spring has Sprung Party. LOVE THIS RECIPE! My have my great-grandmother’s pan still! We like to also melt butter on them and sprinkle with cinnamon sugar or my personal favorite, brown sugar and than roll them up! And the summer I spent in Denmark with her they actually thinly sliced a square package of Neapolitan ice cream and folded them over a slice! YUM!!! That’s a lot of sugar, particularly with syrup on top. Do you know if it could be reduced say to a little less than 1/2 a cup?